I decided to check out my reading progress this year. This year I have read 22 books and have another 2 books on the go. I am hoping to finish the 2 books by the end of the year. If my math is correct I will have completed all 501 books in……..16 and a half years. Yikes! That is a lot of years. Thankfully I had already read War and Peace. Ulysses frightens me. But I always knew I read that book one day. Maybe that is a book I’ll start reading January 1st. The difficulty will be sourcing some of the books. I have the public library which has most of them, the Amazon store and kindle e-books will have most of the rest but there are just some that I am having trouble finding. 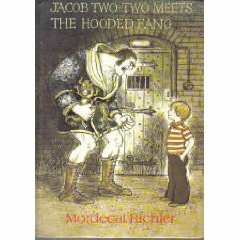 For instance, number 34 on my list is Jacob Two-Two Meets the Hooded Fang – by Mordecai Richler. I am trying to find a copy of this and not buy it from Amazon. I love Mordecai Richler (I once had the pleasure of meeting his son Daniel Richler….while my friend asked him if he had any drugs to sell) and the fact that he has written a children’s book really intrigues me. If anyone reading this post has a copy of Jacob Two-Two and would like to give/lend me this book please leave a comment on this post. It would really help out my quest. Stay tuned for the next 16.5 years.